An illuminated building number assembly (10) includes a one-piece box-like housing (12) constructed of hard molded opaque resinous plastic material and a separate one-piece front panel (14) of molded hard resinous opaque plastic. The front panel covers a housing opening (32) and includes vertical tracks (38a-e) with stops (46) at the bottom ends thereof on each side of the housing opening which allow the insertion of translucent number plates (16) from the tops thereof. A fluorescent light bulb (18) is mounted in the housing along with energizing equipment. When the front panel is mounted at the opening of the housing, the vertical tracks extend into the housing so that the number plates are prevented from moving upwardly by a top wall of the housing. Removable hard plastic mounting strips (20) are attachable at a rear wall (28) of the housing for allowing the housing to be attached externally on a building wall. The assembly can have a light sensor (68) in a separate light-sensor housing compartment to turn the fluorescent light bulb off in daytime and on at night. I am looking to sell this patent outright. No strings attached. No royalties expected. This patent has never been sold or marketed. I'm unsure of the marketing potential. I'm sure it is of great value. I wish to make a clean sale. 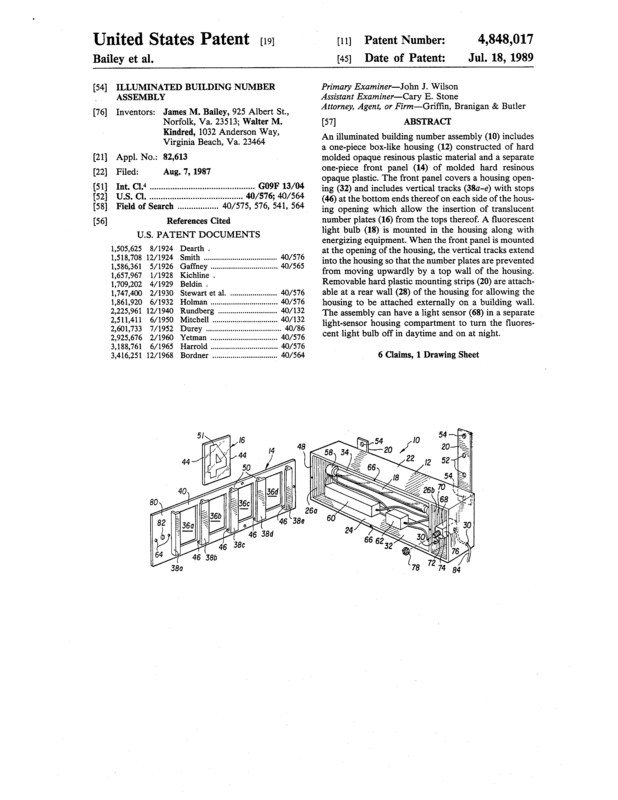 Page created at 2019-04-22 15:01:41, Patent Auction Time.